The set is original benelli, very good quality and I do not sell expensive. For prices, please send private. [QUOTE = GBo; 243953] Hola, ¿cuánto cuestan los cartuchos de horquilla Adriani? The Andreanni cartridges are not for sale. I put them on the new bike. Hope your friend is doing well. Was wondering on the headlamp and gauges? My friend is fine, nothing serious. Bruises and a sprained ankle, thank you. Me preguntaba por el faro y los medidores? [/ QUOTE] Tengo el faro pero los medidores no. Last edited by Canary Trek; 04-15-2019 at 05:38 PM. Hi guys, it's a pleasure to say hello again. As some of you know, I sold my Trek in 2015. The friend who bought it has had an accident and has given me the remains. It has displaced the frame and broken the engine block. I have bought a new Trek 1130 with 0 kms and I have changed the springs of the fork (Andreani), injectors, Z25, rear shock absorber and starter. The fork I sell is in good condition and the springs are new. All carbon parts purchased from Laurence are also on sale. 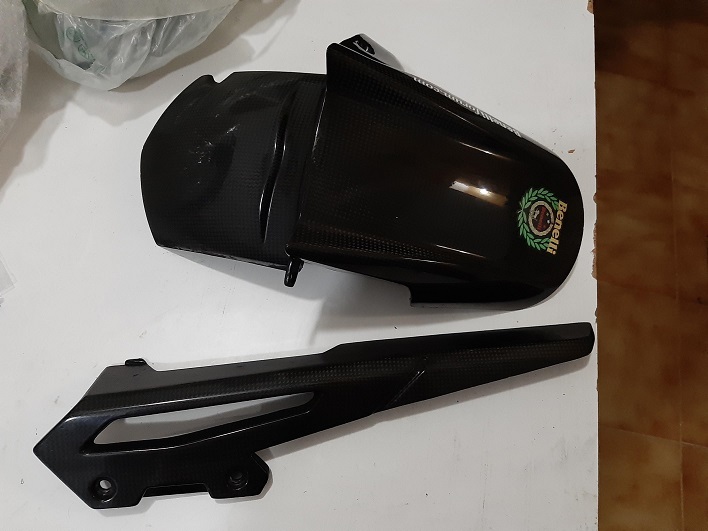 The carbon rear fender is original Benelli. Apologies for my writing, Google translator. I'm in need of the alternator cover, and if the bike had a nice tail tidy instead of the original i'd be interested in that one as well. Heyyy Per, nice to say hello again. I could not resist, the Trek bewitched me. It's in Madrid where my daughter lives. Here I continue with the Tracer, a shot. I think I have some of that. I send you a message. Rather looking forward to my new bits for Nelli ..